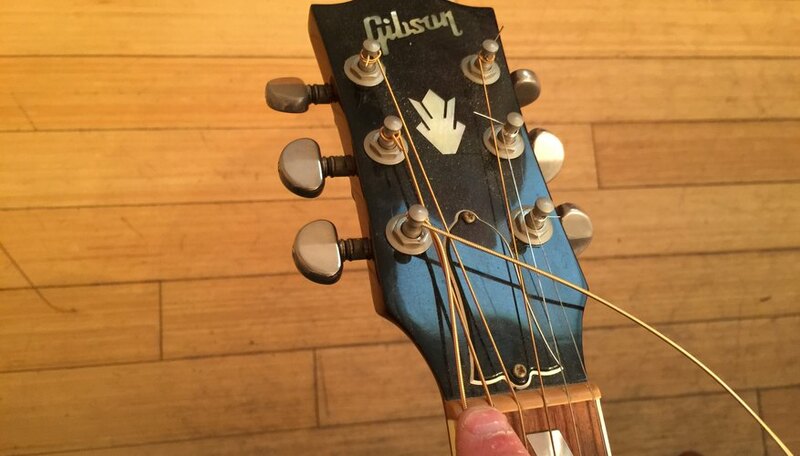 It's important to only remove one string at a time, replacing it with a new string before moving on. First start with the thickest string, the low E, referred to as String #6. 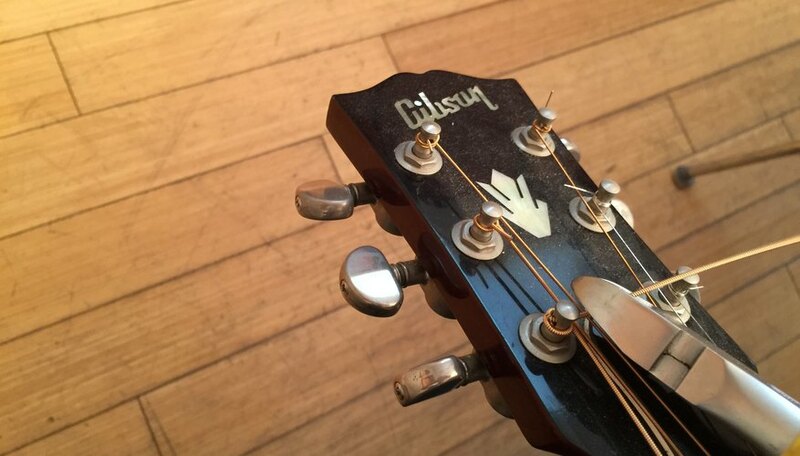 Lay the guitar in your lap with the head stock pointing to the left. 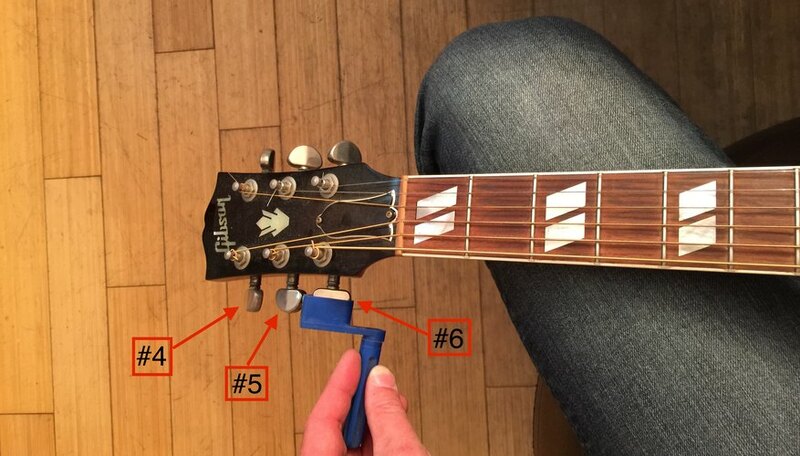 The tuning peg closest to you on the inside is the low E. To loosen, attach the string winder to the tuning peg and turn clockwise until you can remove the string completely from the tuning peg. Next, use the notched side of string winder to carefully remove the corresponding bridge pin. Once the bridge pin pops out, set it aside in a small bowl so it doesn't roll away. Carefully remove the string from the bridge and discard. Unpack the new low E string and unwind it. Take the side with the metal nub and insert that in to the vacant hole in the bridge. Use the bridge pin to push the nub into the hole and lock it in place. Twist the tuning peg until the receiving hole faces the bridge. Lay the string into the vacant nut groove and then slide the free end of the string through the tuning peg hole and pull it all the way through. 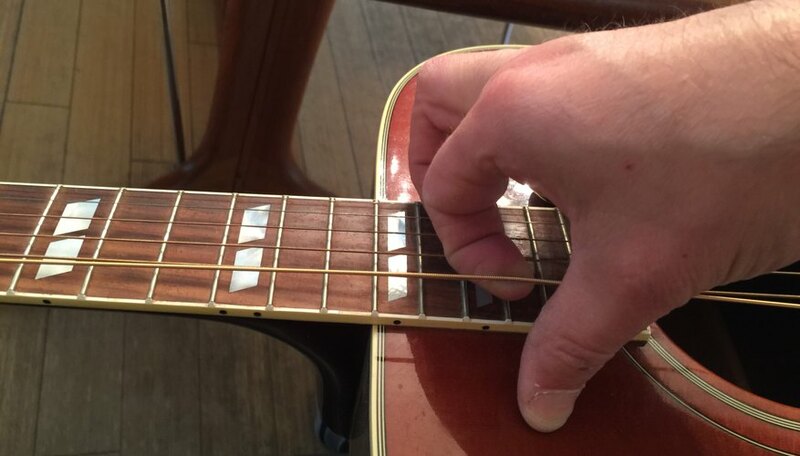 Hold the loose end of the string with your left hand. With your right hand grab the middle of the string, right above the 12th fret, and lift it up 4 to 5 inches above the guitar neck. 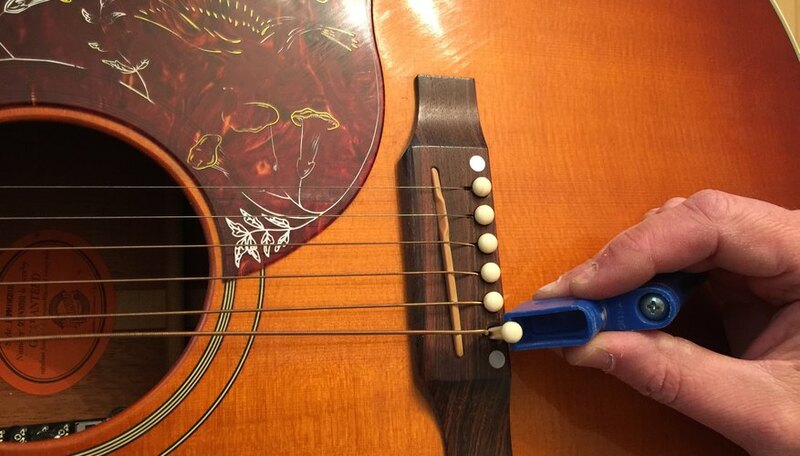 As you pull, you'll need to allow the string to slowly come back through that tuning peg hole, creating slack in the string for tuning purposes. Crimp the string at the tuning peg at a right angle bending the string outward, away from the headstock. 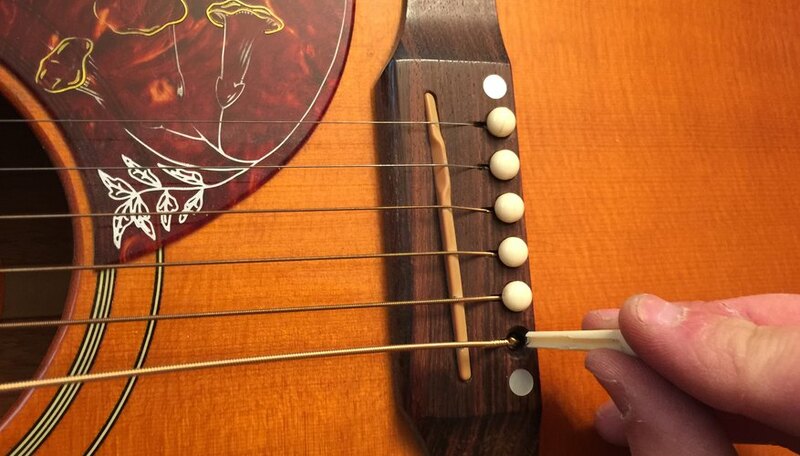 With your left hand, put the string winder on the tuning peg and turn counterclockwise, tightening the string. 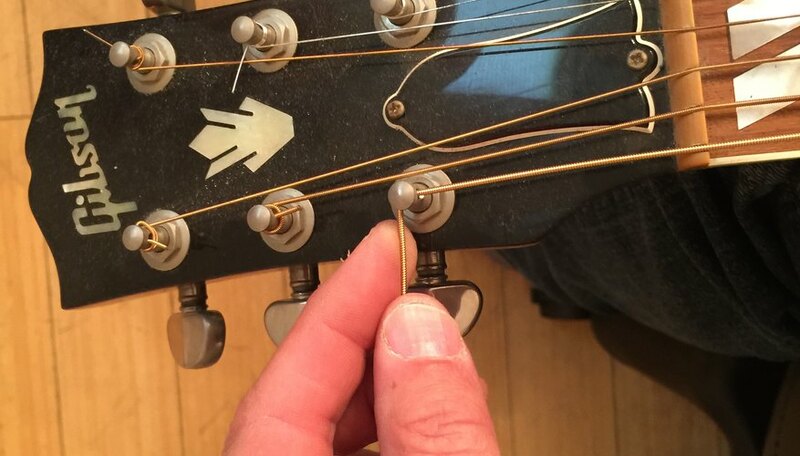 Use your right index finger to hold the string in the nut groove. 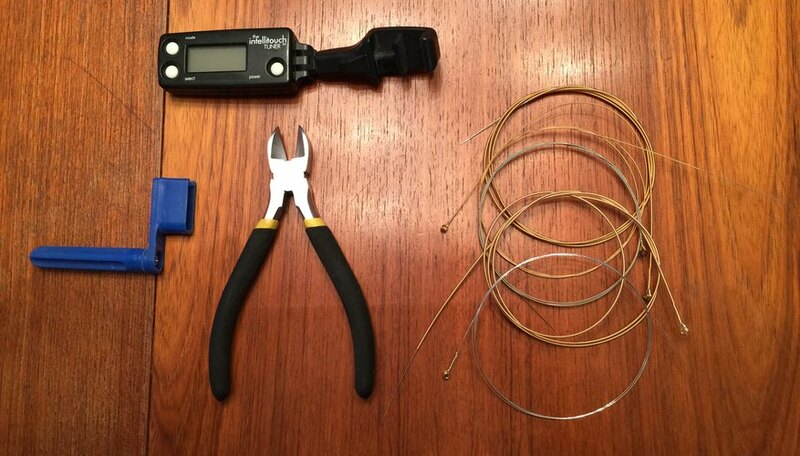 Once the string is fairly tight without slack, use the wire cutters to cut the excess string at the tuning peg. With the string locked in at the bridge and wound around the tuning peg, gently pull it away from the neck at the 12th fret to slightly stretch it out. 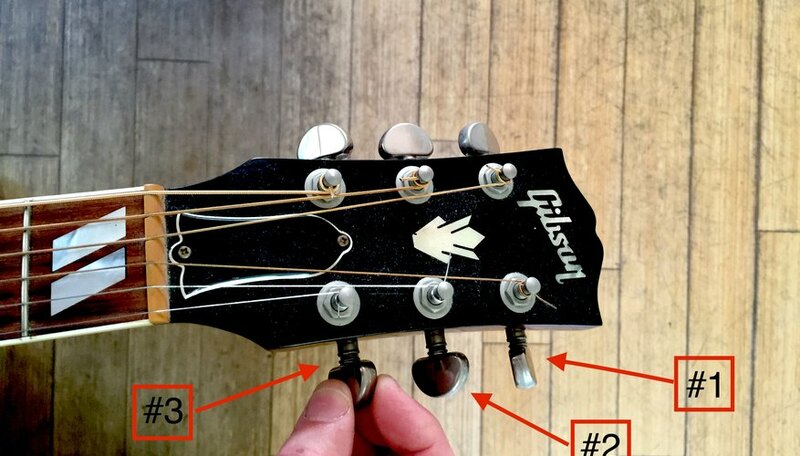 Use the guitar tuner to tune the string to low E.
Repeat the same instructions for strings 5 and 4. Once done with the low strings, flip the guitar in your lap so that the head stock is on the right. Repeat steps 1 through 9, doing one string at time. Once all the strings are replaced, tune your guitar one more time. Replacing those old dead sounding strings can truly add some zing to your string so enjoy the new bright sound.